So you don't own an embroidery machine but want to make a cute door/wall hanging. 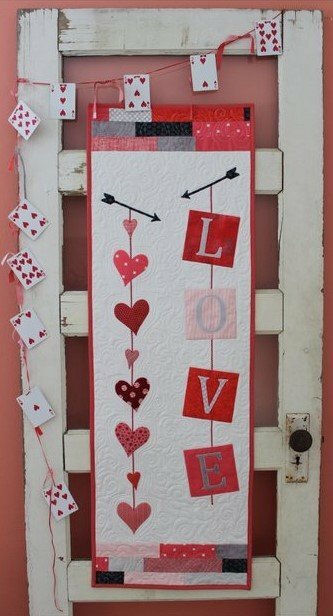 Join us for a machine applique Valentine's themed decoration measuring 16" x 50". People signing up to sew all the monthly projects will also learn to quilt using various quilting techniques such as edge-to-edge, free motion quilting, and even have a chance to use one of our long-arm machines. What's stopping you from learning a new skill? Sign up today. Feel free to substitute whatever colors you would like to use. I like using variegated and metallic threads where I can. Also you can use any pink instead of red or you could do some hearts in pink and some in red.